RECORD SETTERS! BCUCC COMPLETES THEIR COLLECTIVESUN® CAMPAIGN IN 17 DAYS. It kicked off with Solar Sunday on January 31, 2016. 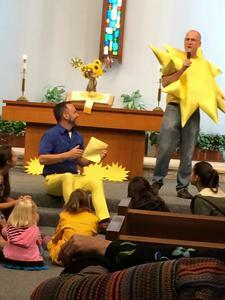 Sunshine streamed in through the windows, reflecting off the bright yellow sun cut-outs everywhere. Solar Team members dressed in yellow. Dennis Arp dressed as the sun itself to demonstrate its power to generate electricity, and give life to the earth. A young church member belted out a solid rendition of “The Sun Will Come Out Tomorrow”. Now that’s how you generate buzz around a solar power lending campaign! Just over 2 weeks later (17 days to be precise), BCUCC was celebrating the completion of their $60,773.20 CollectiveSun® crowd-lending campaign. CollectiveSun® funded 25% of the project by contributing a portion of the solar tax incentives back to the BCUCC solar fund. That made for a great kick start to the campaign, and the rest was in the hands of the ambitious, organized and motivated BCUCC congregation. They even attracted some investors from outside of their church community due to their well-planned campaign and a strong commitment to paying back their investors from their energy cost savings. The Solar Power Plant Project is the shining culmination of a five-year renovation of Brea Congregational’s fellowship hall, which was built over 100 years ago. Their goal was to not only restore the building but to bring it into alignment with green building standards and serve as an example in our community. All these efforts led to the final building improvement: the installation of a solar plant on top of the sanctuary building which will power both the sanctuary and Heritage Oaks Hall. This church was founded as the Oilmen’s United Church of Christ over 100 years ago in this once oil-rich region of Orange County, CA. Over a century later, instead of pulling fossil fuels out of the ground, this congregation is drawing power from the sun. GUEST BLOG: WHAT’S JEWISH ABOUT IMPACT INVESTING?